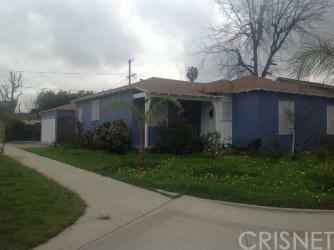 Great opportunity in the most sought-after location in Mission Hills! Investor+GGs delight with a guest house. With over 1,250 square feet of living space on a 7,996 sq. ft. lot, this sweet home has space for everyone and the big lot has space to expand. The generous floor plan provides 3 bedrooms, 2 bathrooms. living room and a good size den, which could be used as a 4th bedroom. Recessed lighting in the kitchen, crown molding, baboo floors in the living room and hallway. Tile floor in the kitchen and bathrooms. The big back yard and front yard has lots of fruit trees it will be a great place to build your entertainment paradise. This is a corner lot and has RV access. 2 big iron gates. Close to restaurants, public transportation and the newest shopping in the San Fernando Valley, OLIVO at Mission Hills. Upgrades can be very easily done.